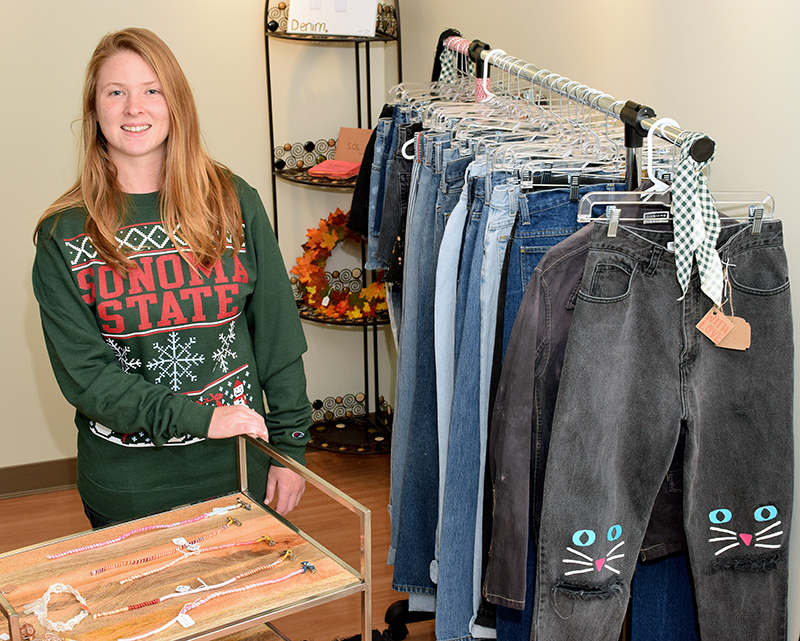 The store is designed to promote entrepreneurship, says student Katie Caughlin, marketing and advertising director of the student-run store. "Made By Seawolves brings the opportunity for students to create a product and sell it on a college campus," says Caughlin. "Students gain experience working with a business and it allows them to support their friends and other students." Overseeing the student management of the store are Student Center Director Jessica Way and Business Professor Kirsten Ely. "We want to give students a safe place to try their entrepreneurship skills in a way that if it crashes and burns, they haven't lost their life savings," says Way. Students got a look at the new store during a soft opening the first week of November. There are currently 18 vendors selling hand-made items like art, jewelry, CDs with original music and upcycled clothing. Vendors earn 60 percent of each sale, with the remaining 40 percent put back into running the store. Ely hopes the store will give students the courage to start their own businesses in the future. "Students see entrepreneurship as something completely separate from student life and school," she says. "I've been trying to work to bring those two things together, so students can see how school blends with what they're doing in real life." Made By Seawolves is open Monday-Thursday, 11 a.m.-2 p.m. and 5-7 p.m. A grand opening is planned for next semester. For more information visit www.facebook.com/madebyseawolves.